We have had the incredible opportunity to develop a lot of interesting pieces of software. Listed below are some of those projects. 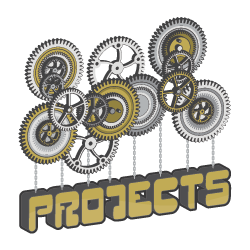 Whenever possible we will include links to the source code repository along with the project description so that: a.) we may share our work with the world, and b.) you, the client, can check under the hood before you buy. A physical therapy office in town was having a terrible time with paperwork which had to be transcribed by hand, sent out to a typist, sent back for proof and then forwarded to the insurance companies. We stepped in and created a web based form, using the Google Web Toolkit, that can be used by the doctors and nurses from small netbook computers to store patient information immediately and directly into their database. One of the larger projects that we have been developing is a web-based system for managing electronic versions of traditionally paper forms. The system uses HTML-template based forms backed by a database system to present forms which can be filled out and signed (using electronic signature pads), saved, and managed (with many analogs to a physical office system - such as adding notes, stamps, moving forms between in and out boxes, approving, etc.). We have developed systems to automate medicare eligibility testing as well as retrieve grain futures prices from Cargill websites. By automating these time-insensive tasks we have saved our customers significant amounts of work by avoiding a manual process for gathering the same information. After encountering significant problems with existing managed off-site backup systems, we developed a simple system for performing file backup using PGP-encrypted files stored on Amazon S3. Although currently the system is quite basic, it is significantly cheaper and more secure than many alternatives currently on the market. We developed a stream mapping plugin for ArcGIS for a graduate student at MSU to assist in their research. The algorithm that we implemented was based off of a recent publication which described a method for estimating the location of stream channels based on elevation data using curvature and aspect ratio changes across the area under consideration. We chose to develop the plugin as a DLL using C# and the Microsoft .NET framework. We recently completed a project assisting in the development of an ArcGIS Geoprocessing script written in Python. Our work focused on consulting with the author about improving the error handling in the script, implementing a logging system, and working with the more advanced/esoteric features of the Python programming language. We are occasionally asked to make software recommendations for our clients. Here is a report we put together for First Choice Home Health of Bozeman that analyzes and recommends health services and blogging software. Using crowd sourcing and AI techniques we hope to generalize and solve the problem of troubleshooting. Stay tuned to our blog in the coming months for more details. A script to remove all non-present devices from a Windows machine using DevCon. See the blog post for more details. A script based on jQuery for improving the behavior of the HTML select element when used for multiple selections. See the blog post for more details.